This post comes to us from Dale Dougherty, founder and publisher of MAKE: magazine and Maker Faire. For the third straight year, Google and Make have come together to put on Maker Camp, a free, online summer camp for teens on Google+. Building on 2 million past participants, Maker Camp 2014 officially kicks off today at 11 a.m. PDT / 2 p.m. EDT today with a Hangout featuring NASA and Buzz Aldrin. -Ed. We’ve always believed that everyone, especially young people, should be able to feel the joy that comes from imagining and creating something that didn’t exist before. Nine years ago, we hosted our very first Bay Area Maker Faire, an all-ages gathering of tech enthusiasts, crafters, hobbyists and artists. The event was partly inspired by the idea that the special creative energy produced by kids is even stronger when they’re brought together. Since that first get-together, it has grown globally with more than 100 events in places like Tokyo, Rome, Santiago and Oslo. Recently, a man in Atlanta told me that “making” changed his son’s life—by inspiring self-confidence through the joys of engineering, design and music. And just last weekend, a family drove eight hours to reach a Maker Faire because their 14-year-old son, Daniel, was so excited about meeting other makers. But eight hours is a long way to drive to connect with other creative kids. So to make sure that inspiration and community are more accessible to young makers—no matter where they are—we teamed up with Google to create Maker Camp, now back for its third summer. 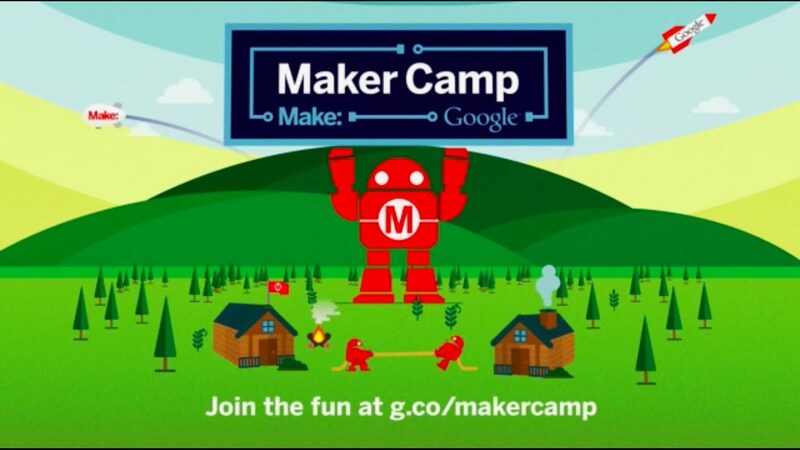 Through Google+, Maker Camp connects young makers from across the globe as they create, invent and build projects like soda bottle rocket fireworks, glowing bikes, and LED shoe clips (our version of arts and crafts). In addition to the daily projects, campers will join epic virtual Friday field trips to places like +NASA Goddard Space Flight Center, Google [x] and +LEGO Education. Camp is available to anyone with an Internet connection and an imagination—and kids who’d rather gather together around the digital campfire can visit one of Maker Camp’s 500 local “campsites” hosted by libraries and community centers, in locations ranging from Australia to Jordan. So roll up your virtual sleeping bag and come join us at Maker Camp this summer! To get started, simply follow +Make on Google+.